1. Dearborn at Adams street. Shake it up, baby! 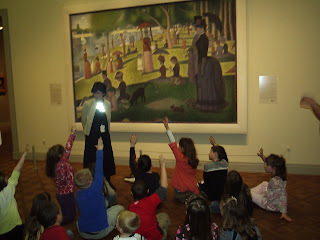 Like a modern-day principal Rooney, you can spend an entire day off in Chicago searching for Ferris Bueller. "Ferris is one of my favorite movies of all time. It has one of the highest repeatability factors of any film I've seen...I can watch it again and again." 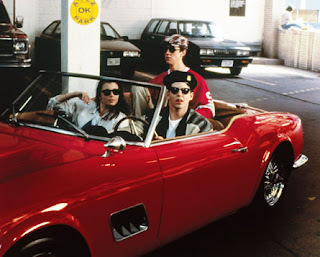 So, I spent much of last year's Chicago trip scouting Bueller locations, from the parking garage that looked after Cameron's dad's red Ferrari to the red mantis sculpture on Dearborn St. where Ferris rocked the 10,000-plus crowd with Twist and Shout (the first place to visit, above). This year, I'll probably do the same. Visit the locations, not rock the crowd, though I won't rule it out on a future visit. And, this year, I no longer believe that one can reverse mileage on a Ferrari by propping up its back wheel on a cinder block right next to a wall-sized window. What the hell was I thinking? "Who here has a domineering father and an empty life?" Good times, for a change! So, you're not allowed to take a photo of any of the artwork at the good Institute, I found out after I took this one. D'oh. 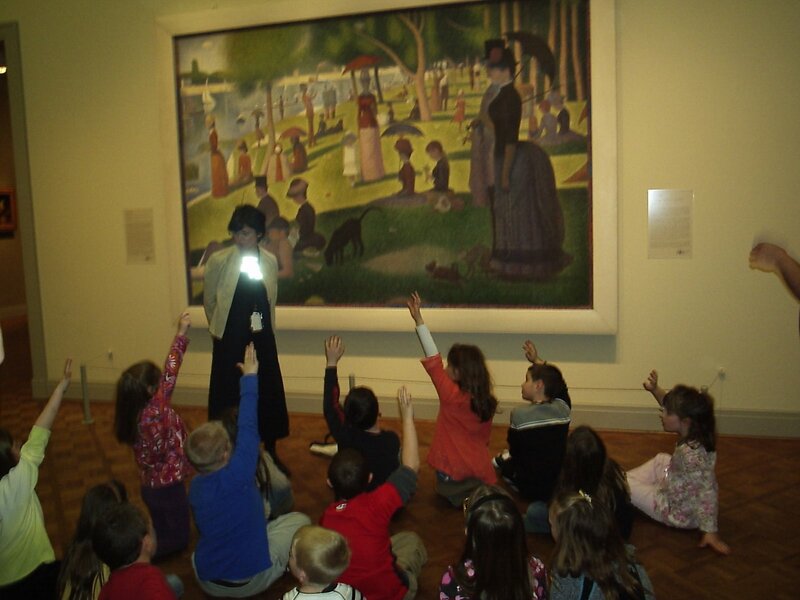 But you can gaze into Georges Seurat's "A Sunday on La Grande Jatte" and reflect on the emptiness of your life, just like Cameron did. Tip: wearing a Detroit Red Wings shirt only enhances the experience! 3. The Sausage King of Chicago ate here - 22 W. Schiller St. It took me a while to track down this one. For some reason the address has been removed from this location - too many middle-aged guys looking for the place where Bueller pretended to be Abe Froman, the Sausage King of Chicago, I'll wager. A lovely residence and a lovely walk through a lovely neighborhood. Lovely. Not much to see here, except the most-famous parking garage in history! Bring the Star Wars theme on your iPod. 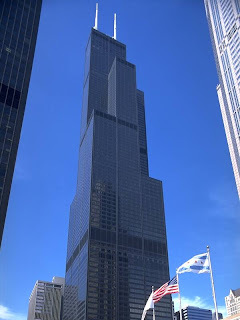 Everyone on the trip gets a pass to the newly named Willis Tower. Call it "Sears" if you don't want a Chicagoan to beat you senseless. Press your head against the glass and contemplate the ant-like nature of humankind, just like Ferris did. And, take a step out onto the new, 103rd-floor glass balconies, which Ferris couldn't and didn't do. 6. Wrigley Field - 1060 West Addison St.
Home of the Chicago Cubs and the place where Cameron chanted: "Hey batta batta batta batta batta batta batta batta batta swing batta!" You've gotta take the Red Line train to get there, but it's worth it, especially if the Cubs happen to be playing that day. 7. Chicago Board of Trade - 141 West Jackson Blvd. If you're going to propose to your honey on the trip, do it like Ferris did: at the Chicago Board of Trade tower while Cameron practices his floor-trader hand signals. You can't book a tour anymore, thanks to those terrorists who hate all of our freedom. But it's still an awesome tower. And you can still propose. 2. Ferris' school exterior: Center for Performing Arts, 777 N. Green St., Chicago. 3. Save Ferris water tower - North of Glenbrook Station, between Cedar Lane and Meadow Road. They apparently really painted the slogan for the movie, but - sigh - it's painted no more. 4. Cameron's home - 370 Beech St., between Linden and Wade. Includes the glass Ferrari garage, and it can be yours for a mere $1.8 million. Tom Cruise also lived here in Risky Business. 5. Ferris' home - uh, it's in California. D'oh! I watched Ferris Bueller for the first time last week, and loved it! I wish I'd seen it sooner. I've never actually wandered around a city looking for shooting locations - likely because I so rarely travel to anywhere films are shot! It seems like it'd be a lot of fun to do though! You can take pictures of the art at the Art Institute, you just can't use a flash (which I see you did, judging from the reflection in the glass.) It's bad for the art, sor somthing. All my pictures came out crappy because of it.